Two or three years ago, I got my degree in film. I wanted to be a screenwriter since the beginning of the course and I graduated as one, with a script written in a syntax developed by John August, Nima Yousefi and Stu Maschwitz called Fountain. 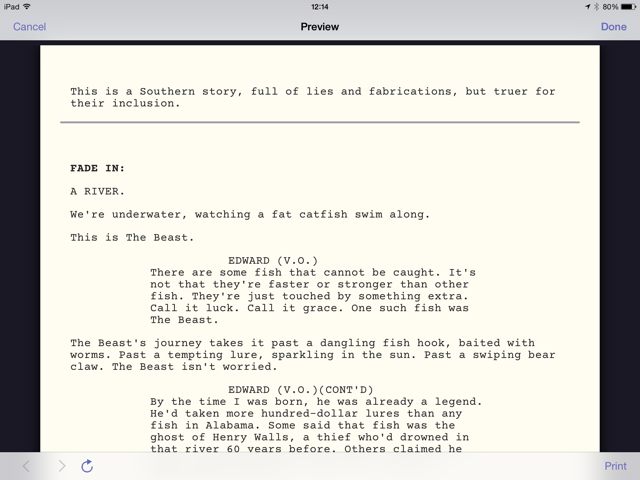 Screenwriting has a strict formatting rules and used to require either expensive (Final Draft) or bloated (Celtx) software; Fountain took the game to plain text. There are affordable alternatives on the Mac and iOS such as the Fade In suite nowadays, but I still advocate Fountain as I would Markdown. Highland and Scrivener aids me on the Macbook; yet I'm disinclined to pick my iOS devices to proceed my writing. Writing Kit previews Fountain files1 and I can neither confirm nor deny that Editorial will support the syntax soon. Meanwhile, I wrote a parser for Fountain files in Drafts. Excerpt from Big Fish by John August. For the best results, I use Courier Prime, an open source typeface by Alan Dague-Greene. I use iZip Pro to unzip the font family — There's a free, lite version you can use. I install the typefaces with AnyFont, a $2 utility dedicated to that. You may think that's a steep price just to change a typeface, but I'll show you the difference. 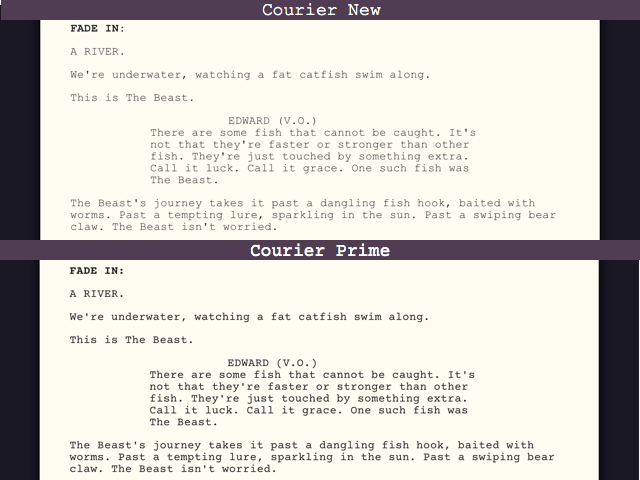 Comparing Courier New to Courier Prime. The latter outshines. I don't care how you do it, but I pledge you to set Courier Prime on this. I still prefer to read screenplays with Weekend Read, but this is nice to peek while you write your story.